The greater level of expense is due in part simply to the fact that benefits are paid more often than they would be with a reimbursement policy; specifically they are paid whether or not the insured receives paid care and the benefit is available to be paid every day the insured is disabled, compared with a more intermittent payment schedule (e.g., 4-5 times a week) for someone with a reimbursement policy since that reflects the more typical pattern of paid service use. There are additional factors playing in to the higher costs of the cash model including greater administrative costs relative to functions around benefit determination, re-certification and fraud management. These are discussed in a later section. Another concern with cash benefits is a higher claims denial rate which in turn generates greater administrative costs; this will become even more of an issue as a growing number of states require independent third party review of claim denials. Another cost disadvantage for the insured is the fact that a cash benefit typically has little or no “salvage” value. Salvage refers to the pricing concept whereby the insurer assumes that neither the full benefit amount per day nor the lifetime maximum will be fully utilized; this is especially true with high daily benefit amounts. With a cash benefit, the experience is that there is little or no “salvage.” Thus, insuredsare not able to “conserve” their lifetime benefit maximum if they have coverage of less than “lifetime” duration because they will receive a cash payment on every day they are disabled even if they are not incurring expenses; these payments would “draw down” on their lifetime maximum. Of course, the individual can choose not to make a claim for benefits under the cash model as a way of conserving benefits but that is more difficult to do (logistically and practically) with a cash benefit. The appeal of receiving cash (perhaps to be used later if needed) is a strong incentive to make the claim rather than “holding off” just in case more care is needed later. 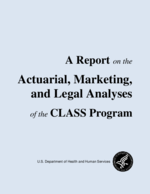 One carrier cited the “hassle factor” as a reason that a reimbursement benefit costs less than a cash benefit -- meaning that the more documentation that is required to make a benefit claim (e.g., providing documentation of covered expense), the less likely the individual is to make the claim. The lack of a “hassle factor” with a cash benefit therefore can be another factor making it more expensive. Another disadvantage for the insured is that they have to manage their cash benefit dollars and take sole responsibility for finding, arranging and verifying the appropriateness and “quality” of the care providers they elect to use. I don’t find this argument very compelling at all. In the Lifeplans LTCI admission cohort survey, it was clear that claimants very rarely relied on insurance company case managers to identify specific providers or “arrange” services for them. They picked their own providers (NF, ALF, home care) based on their own criteria. For NF, ALF it was reputation in the community, physician or other medical provider recommendations, and proximity. For home care, it is less clear what criteria claimants used to pick specific providers were chosen, but two thirds of claimants used agencies and one third hired individual providers. Let’s just imagine that an insurance company provides a “recommended” plan of care. The operative word here is “recommended.” Is a home care agency going to follow that plan to the letter? I doubt it because the schedule of service (e.g. how many days a week, hours, morning vs. evening) and tasks to be performed (baths on which days) will be worked out between the claimant and the agency (or individually hired aides). If the insured has given power of attorney to a caregiver or family member, there is no guarantee that the cash payments will be used as they should be to provide and pay for care. Some carriers provide a detailed plan of care that makes recommendations with regard to the nature and type of care insureds need to best meet their situation. Following this plan of care can help insuredsmake the most of their cash benefits. Insureds may also use up total benefit dollars faster since benefits can be paid out even if they are not incurring expenses (e.g., if family or friend are providing care at no charge). Unless the insured “saves” those cash benefit payments for later use when paid/formal care is the only alternative (e.g., nursing home care perhaps), the benefits available at that time might be greatly reduced. While likely, there may be negative tax consequences for the insured with a high pay out cash policy. HIPAA imposes a limit on the amount of cash benefit relative to the amount of long term care expenses that can be received tax-free with a tax-qualified policy. In contrast, there is no limit on the amount of reimbursement for expenses that can be received tax-free. Some cash benefit options today can have a rather high daily benefit amount so it is not entirely unlikely that someone could receive, say, a $500/day cash benefit and incur no long term care costs -- in which case they could face a tax liability based on the amount in excess of the IRS cap (today set at $290). This would mean that $210/day (or over $76,000/year) could be considered taxable income for the insured. This concern is less critical for CLASS given the significantly lower benefit amounts being considered. One of the most important disadvantages for the insurer is the fact that a cash benefit is more costly for the insurer to administer (which translates into higher premium costs) because of the need for more in-person assessments and more frequent reassessments. Without the service records or provider input the insurer would receive under a reimbursement model, the insurer cannot assess continued benefit eligibility without doing costly in-person assessments more frequently than they would otherwise do. There is also considerable potential for fraud and abuse given the incentive for someone to “stay on claim” even when they are no longer chronically ill -- an incentive that is much greater when they are receiving a cash payment, without a requirement to receive services. Surprisingly, there is a fairly significant “recovery” rate in long term care -- one estimate cited by a large third party administrator finds that 30 to 40% of those who meet the benefit triggers and receive benefits eventually recover. So the ability to continually re-assess eligibility status is critical to the accurate payment of benefits. Additionally, without service records or provider input, the insurer cannot assess continued benefit eligibility without doing costly in-person assessments more frequently than they would otherwise do so.